and in midlands of South Carolina we saw more than our normal two flakes of the white stuff, I’ll dub this winter, the Winter of Mac and Cheese. This staple of homecooked comfort food has hit the menus in some pretty swanky places, and has evolved past its elbow macaroni and cheddar cheese origins to include some exotic ingredients. Just last Wednesday night at Columbia’s Momo’s Bistro, the oohs and ahs were profound when the regulars noticed the return of favorite Lobster Mac-n-Cheese. Over the winter it had been replaced for a while by Duck Mac-n-Cheese, and then Rabbit Mac-n-Cheese. Both were delicious, but while eating both the duck and the rabbit, the conversation had invariably returned to the lobster dish. All three of these dishes use the slightly concave orecchiette pasta, which literally means “little ears.” Orecchiette is especially nice for creamier sauces because those “little ears” serve as pockets to hold sauce while you get a forkful of pasta and perfectly cooked, juicy lobster. 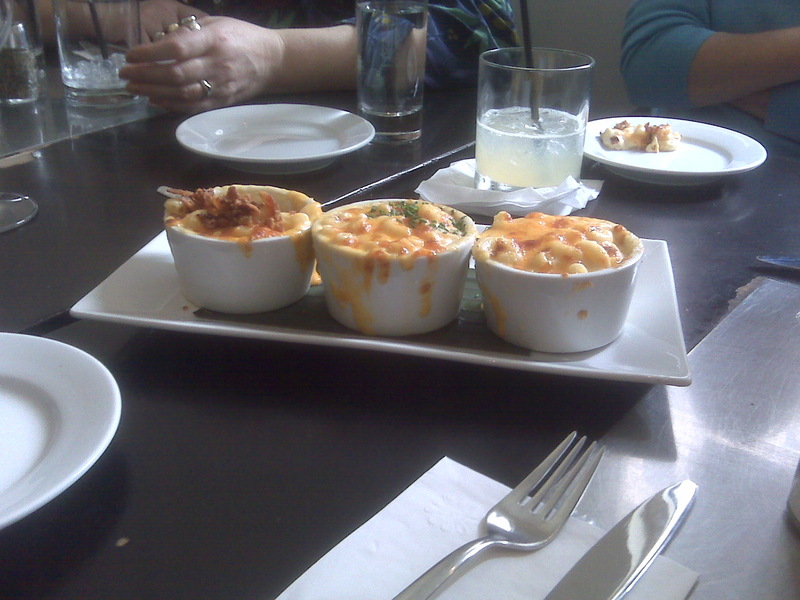 While recently dining at New York City’s Cafeteria Restaurant, our group was served a trio of mac-n-cheese as an appetizer. One was a fontina and cheddar sauce with fresh chives sprinkled on top, one had smoked gouda cheese with bits of hearty bacon mixed into the sauce, and the third was a luxurious truffled mac-n-cheese. All were delicious, although my favorite was the truffled mac-n-cheese with the earthiness of the truffle oil sprinkled atop the creamy fontina cheese. My mac-n-cheese is a three-cheese monster mac with cream cheese, cheddar, and gruyere flavored with caramelized onions and sweet red peppers mixed in with the ridged penne pasta. This mac-n-cheese is a great base for any number of additions (can you say bacon?). I’ve also cooked it in small individual casseroles for a wonderful presentation. Heat oven to 400°. Cook penne according to pkg. directions and drain. While pasta is cooking, in 3-qt. saucepan melt 1/3c. butter; add onion and red pepper and sauté over medium heat until onion is sweetly carmelized. Add flour, stirring occasionally until flour is smooth and bubbly. Stir in milk, cream cheese, salt, pepper, and mustard. Continue cooking until, stirring occasionally until sauce is thickened. Stir in penne and cheese. In a small bowl stir together remaining ingredients; sprinkle over pasta and cheese. Bake for 15 – 20 minutes or until golden brown and heated through. I don’t normally post to blogs but I enjoyed this post so keep up the good work.